Someone asked me about this today and I thought of it is a useful tip to write a small post. See the below code. If you know how to setup the same method in such a way that it would not override during the test execution, you can stop reading the rest of the post. If not please see the below example. Notice that the same method call twice with different parameters. In our Unit Test, if we were to stub these two methods, the second/last setup method overrides the first one. In other words both r1 and r2 has the value of “bar”. This is not what we expect as we want setup methods to behave differently and return different values for r1 and r2. Couple of ways you can achieve this with Moq. You can specify a predicate that matches a specified criteria. Provide the delegate on the “Returns” that match the criteria. The below article describes the new MS-Test Unit Testing features available within Visual Studio 11 which encourages developers to write good Unit Tests and follow best practices such as TDD. Devs- Are you interested in reading about TDD with ASP.NET MVC and xUnit.NET – using new VS2012RC Unit Testing features? If yes, please download the first issue of the DNC Magazine. For more info, please refer to the article below. While searching for Moq code samples, I came across that Moq 4 was released few months ago. The key improvement was the new “LINQ to Mocks”. This post demonstrates few examples of the usage of Mocks and LINQ queries. For each example, we stub out dependencies using lambda expressions first, and then see the corresponding LINQ version. At the end we see the performance of each Unit Tests. Note: I’m using the xUnit Testing Framework. However you can apply the same principles to other Unit testing frameworks. – The tests with LINQ queries reflect the test scenarios/conditions in a more of a specification style. This improves the tests readability. – The query returns an infinite number of mocks. Typically we access the first element. – LINQ query result returns real object(s) and not the type Mock<T>. So we do not need to use the EmployeeServiceStub.Object. Instead we can just use the returned element. – When you have multiple stubs or mocks, you can return all of them using an anonymous type. – Not used in these code samples, but if you are using the MockFactory class, it is now absolute in v4. MockFactory will be retired in v5. Here is a very quick benchmark results on each Unit Test. Unit Tests with LINQ queries take “tiny” bit longer than the Lambda counterparts. However, I would personally still use LINQ version as it improves the readability of Unit Tests. I briefly touched based on this during my presentation at Code Camp. There were number of developers who were interested in browser based Unit Testing. This blog post is to provide you with some information on how you would automate browser based Unit Testing with VS2010. As described in the JSTestDriver Getting Started, you can use the below command to run both Java server and the client using a single command. Next step is to automate the above command within VS2010. You can easily achieve this by using VS External Tools. · Initial Directory is the path to the directory where the JSTestDriver is located. · Ensure you select the “Use Output Window” check box, so you can see the Unit Tests result in the output windows. Once you run the VS external command, you should be able to see your output similar to below. You can further automate this by running a VS macro, so every time when you save a JS file the above command will run all browser Unit Tests. I hope you all had a great time at Code Camp and a safe journey back home. This blog post is to provide you with some additional references on the presentation Real World Unit Testing & Future. I have also included some answers to the questions which some of you have had after the presentation. At the end of this post, there is a link and you can download my presentation slides. Links to Roy Osherove’s Test Reviews. Question on multiple Asserts in a Unit Test? Post presentation questions interested me that some of you have different opinions on having multiple asserts within a Unit Test. The point I wanted to make was, as a general rule, it is best to have one assert per Unit Test. Having said that, there may be instances where you would like to test logically related things within the same Unit Test. Which means “Multiple aspects of the same object”. If one aspect fails then we would consider as the Unit Test is fail. //Different aspects of the same object being tested. Having multiple asserts in Unit Tests raise maintainability issues. If the first assert fails, then the subsequent asserts will never get executed. We would never know those subsequent asserts were succeeded or not. Since it is a partial picture, sometimes it is very hard to isolate the problem why the Unit Test is failing. If the tests are separated and solid they are easier to read and easier to maintain. Also I came across with another tool (NUnit Addin for Running one assert per test ) which I did not include in my talk, but please feel free to have a look at this. The difference between the Code Contracts and Unit Tests. There was a question on Code Contracts and Pex. Code Contracts allows you to perform powerful assertions within your production code. It encapsulates the intention of your design using contracts, so the compiler tools using Static Analysis, Runtime Analysiscan be used to discover those intentions (E.g Pre Conditions and Post Conditions). Unit Test, verifies a piece of logic/behaviour within a method while allowing you to improve the design of the production code. One cannot replace each other as they both have different purposes. Where can I get more information on Code Contracts and Pex? 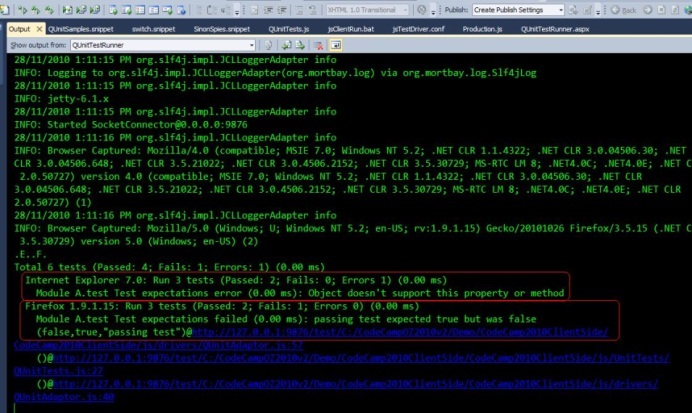 Code Camp 2010 – Real world unit testing from David Burela on Vimeo.